The image above is from the Coordinated Incident Website for the Western US. This is the picture for August 29, 2013. They mark only the “Significant Events.” They are the fires that are, in many cases, burning out of control while we wrangle over whether or not to insinuate ourselves into a civil war on the other side of the world. Truly, Rome is burning while Nero fiddles away... -ed. Think we need more Defense Budget? Here’s the one to fund: US Forestry Service. In a 2012 issue of Inspire magazine – an allegedly al-Qaeda backed publication – potential terrorists were encouraged to commit arson, especially in our wooded parklands and forests. An iconic 193 million acres representing much of what we and the world see as America, are susceptible to the acts of a few (possibly only marginally) dedicated individuals – of either foreign or domestic origin. And, they’re economical to start: The cost of a match and a gallon of gasoline. There are few, if any, witnesses. There is no video surveillance - no omnipresent video feeds to detect who did what: They’re anonymous...they’re deadly. They’re happening right now at our door, yet few of us seem to care. We lack awareness. We don’t understand that we face potentially hundreds of billions of dollars in costs every year if we remain complacent. Look to the Rim fire currently burning in California: encompassing more than 200 square miles and swiftly moving in on Yosemite National Park while simultaneously threatening to destroy many of California’s monuments to American history memorialized by Mark Twain and other writers of the time, who chronicled (and sometimes dramatized) the people and events of Twain Harte, Jumping Frog, Angels Camp, and other towns throughout Tuolumne and Calaveras counties. The Rim fire promises much more, though, including the loss of fresh water for the 2.4 million people who have no other adequate ready source, and for the millions of hydroelectric customers who will live in darkness for weeks to come if the potential worst occurs. Truly, the Rim fire will pass into history as one of the most devastating, yet it’s the least that could happen if those who are driven to harm us, for whatever reasons, do so. At present we face the most significant fire season in recent history according to the Forestry Service, for a variety of reasons including drought perpetuated by our changing climate. But, according to the National Interagency Fire Center (NIFC), 90% of Wildfires in 2010 were of Human cause: 64,807 Wildfires in the US consuming 3,422,724 acres of natural beauty. Of these 7,164 were Lightning caused. In 2001 the percentage of Human caused Wildfires was 83%, and it steadily increased over the ensuing years to where it is today: 90%. Every year, we experience more Human caused fires that are significant events. During fire season if you take a drive along Interstate 40 east of Kingman Arizona, and probably west too, you’ll see “burnouts” along the shoulder of the highway, far more frequently than one would imagine possible owing to careless smokers. Various reports associate these small events with people willfully throwing out crumpled newspaper set afire intentionally to start a major fire. Fortunately, most are not significant and one of the nearby local fire crews quickly extinguish the small blaze. But these too are at a cost: like petty theft, the costs quickly add up. In the last 90 days of this fire season, 20 of what is termed, Significant Wildfires, have occurred in Arizona. 12 were reportedly caused by Lightning, including the Yarnell fire killing 19 Prescott firefighters, with the remaining attributed to Human. Of those eight, all remain Under Investigation. “Amid talk of budgets and the sequester, the U.S. Forest Service Chief was questioned Tuesday about the agency’s 2014 budget on Capitol Hill. 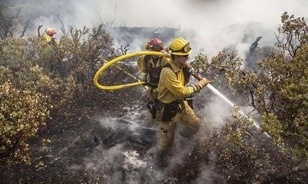 “Chief Tom Tidwell says sequestration has forced his agency to reduce funding for firefighting aircraft, eliminate 500 firefighters and up to 75 fire engines. In the last ten years our Defense Budget, with Sequestration, has more than doubled, yet John McCain wants more. ...in this potentially devastating new form of Terrorism? Is it literally a line in the sand in Syria? Is it somewhere else in the Middle East or Africa? Is it through further deployments in Nigeria and Drones in Yemen? It’s here. And it’s right now. A few years ago $300 billion every year was sufficient to keep our post-Soviet war machine well-greased and functional. There is no threat that warrants expenditures twice that today. There is no logical reason. As of today, the costs associated with fighting the many Wildfires across the US has topped $1 billion, or 1/600th of our current Defense spending. That’s just for Suppression. According to the Bureau of Land Management (BLM), the real money comes into play when other Direct, Rehabilitation, Indirect, and Additional costs as outlined in the BLM’s publication, True Cost of Wildfires, are factored in. Factor in Terror, too: A Wildfire that occurs, or grows to within the thousands of Wildland Urban Interfaces (WUIs) that border our parks and preserves are particularly terrifying, resulting in the loss of homes, lives, or, at the very least, evacuations and hardships. Experience tells us that nothing of benefit has come from increased Defense budget funding other than to perpetuate an outmoded non-Diplomatic solution, while pumping more money into companies that contract to our government, that in-turn offshore those jobs to other countries. In the end, we make more enemies. Use our budget where it counts. The War is at our doorstep today, and it’s a war nearly everyone of us will agree must be fought. Use the Congressional Contacts list always at the bottom of this page and write your representatives urging them to support greater funding for the US Forestry Service.